I’m in new territory here. The only thing I’m doing these days is giving myself permission to just hang in there, hang on, and get through this cancer mess. For the first time in my life, I’m not accomplishing anything, I’m not pushing, and I’m not moving forward. It feels weird and strange and quite unlike myself, as if the chemo weren’t doing that already. When I was nine years old, I distinctly remember vowing that I would not live my life the way my parents were living their life. It was moving day again and my family was piling into yet another rental I was wondering if we’d be able to afford because we’d been evicted from the previous one since my parents couldn’t pay the rent. This was the seventh place we’d lived in in my short nine years and I’d had it with the evictions. I remember thinking to myself, why can’t he be definite about this? I’m not going to live like this. Since that time I’ve pushed full steam ahead to live the life I wanted to create, not the life someone else destined me to live. I’ve pushed and pushed and pushed–myself, Libby and everyone else around me to be as good as we can be, to go further, dig deeper and make the life of our dreams become a reality. Some people get it, some people don’t. It’s who I am and what I do, or rather, what I did. Out with the olds and in with the news, though. It’s a whole new world I’m adjusting to, new terrain I’m adapting to, and a new set of standards for my days. It hasn’t been easy to accept that hanging in there is the new bar that I can’t raise any higher right now, but it’s necessary. Just let me hang in there and hang on so I can get back to the life I’ve always lived. Thanks for reading. As always, it helps. I guess it served me well, Lisa, since I’ve had an itinerant adulthood, though for different reasons! Sending you a big hug. This post is such a good lesson about life. There are times when you just HAVE to surrender to the present. Life has ways to force us to be still. Hanging in there is as brave and worthy an activity as any. Thank you for sharing your words, wisdom, and honesty with us. I am really sorry that life threw you this curve ball, and with your determination I have no doubt that you will navigate your way through this just fine…the one (selfishly)good thing is that I get to read your blogs! Thanks, Nancy! So I will just say…that cancer mess (and I like the way that you put that:)), is another rung on that ladder you’ve been climbing. And may you continue to sparkle as you climb. Sparkle in good ways, sparkle in bad ways….just sparkle. You go girl. Hanging in is a mega marathon, and you have a crowd. Dear Nancy, thanks for writing this. It really spoke to me. Once I went through a really bad, really terrible depression. I totally get what you are saying – I am definitely a pushing kind of person. Always determined not to repeat my family stuff and steer my own course. During my very painful depression – I remember rearranging in my mind all of goals. My goal simply became to hang on – to get through each day. Thanks for writing this – it helped me and spoke to me. 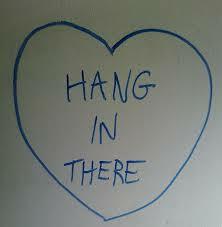 Thinking of you and sending love in solidarity of hanging in and hanging on. And I MISS you- the all of you- pushiness included. Most of all, thank you for accepting our love. In my life, that’s a biggie. So, thank you, again. read ’em all nance. thank you so much for writing them.